How can progress toward the health and health-related Sustainable Development Goals be accelerated, and what role can the private sector play? At least 400 million people globally lack access to essential health services such as immunization, family planning services, and primary care hospitals, according to the World Health Organization. For 100 million people, accessing that care means being pushed below the poverty line due to out-of-pocket expenditure on health services, resulting in either unnecessary deaths or being driven into extreme poverty and debt. That’s why it’s so important that Sustainable Development Goal 3 — to ensure healthy lives and promote well-being for all at all ages — along with others that intersect with health, such as SDG 2 on eliminating hunger, SDG 4 on ensuring quality education, and SDG 8 on decent work, are achieved. So how can we make inroads on the health and health-related SDGs? 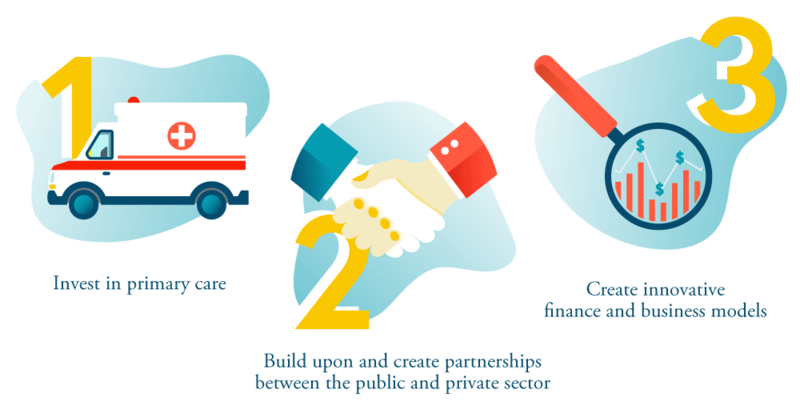 We take a look at the role of the private sector. Universal health coverage — the idea of access to health services for all without exposing the user to financial hardship — could be one solution the private sector could put their resources and expertise toward. It’s an idea that Devex, in partnership with Philips and other organizations, delved deeper into in 2017. The online content series Going for Goals focused on the financing needed to boost efforts around primary health care, and in turn UHC. A second online content Healthy Horizons took the temperature of the development sector to analyze how to make UHC a reality. We then took the dialogue around health access one step further when stakeholders from around the world gathered at the United Nations General Assembly to discuss access to health care at a special event, Closing the Gap: Innovative business models for UHC. This action-oriented discussion focused on the innovative new business models needed to secure quality UHC. The "Closing the Gap: Innovative Business Models for Universal Health Coverage" event in New York City on the sidelines of the U.N. General Assembly welcomed over 100 top executives from business, government, international institutions, and civil society. Through both the event and the two online series, we heard from thought leaders about how progress within health will be achieved and what financial models are needed to make these concepts a reality; we engaged in cross-sectoral conversations to amplify the conversation around sustainable solutions; and Devex’s reporting team investigated two on-the-ground health services to see what lessons could be learned on achieving primary health care and make steps toward UHC. Of course, these activities made clear that there is no silver bullet and no easy solutions to mobilize in reaching UHC and tackling the health-related SDGs. In fact, Devex asked if it was even possible to achieve and found that there are many interrelated components needed to make it happen. Mark Dybul, former head of the Global Fund to Fight AIDS, Tuberculosis and Malaria, wrote that effective health care requires efficient supply chains and procurement systems; data management systems that allow communities of practice to focus on health outcomes; more human resources; and more robust financial management, among many others. It’s a long to-do list, but that’s not to say UHC cannot be achieved. Primary health care is important as the first point of entry within a health care system and a strong and efficient system is needed to achieve UHC. It should be designed based on community needs and include services ranging from prevention to emergency care. This would ensure the systems are fit-for-purpose in tackling disease burdens — both now and in the future. Head of the clinical and wellbeing program of the Philips Africa Innovation Hub, Luc de Clerck pointed out that 90 percent of health issues can be handled at the primary care level. Maternal care services are one such example. Devex travelled to Papua, Indonesia, to look at how technology, training, and partnerships between the public and private sectors can lead to improved care for pregnant women and mitigate against future health issues. One of the biggest factors affecting the rate of maternal deaths in the region is a lack of access. Local midwives in remote corners of the country are on the front lines of primary care, but are not necessarily adequately trained, with a dearth of specialist obstetricians and gynecologists. But in Jayapura, the province’s capital, steps are being taken to counter this problem in primary health centers at the heart of the communities. Philips partnered with the local government and telecommunications company Telkom to launch its Mobile Obstetrics Monitoring system, or MOM, to improve data collection and help ensure the health of pregnant women is being adequately tracked to help prevent potential complications. Primary health care is also a critical entry point for those who may show symptoms of cancer, according to the Union for International Cancer Control. There are a number of opportunities to integrate cancer interventions into existing health services at primary care level, such as cervical cancer screening as part of prenatal care, delivering palliative care through home care services, or referring people with early warning signs to the appropriate health facilities. UICC advocates for better equipped centers with skilled staff and essential medicines, along with technologies that provide oversight via treatment guidelines, processes, and standards. In addition, establishing accountability mechanisms for the monitoring of safe and quality cancer management, working in the catchment area to develop strong referral pathways hand-in-hand with primary and secondary care providers, and leading education and training to develop the next generation of cancer specialists for the multidisciplinary teams are all key to optimizing patient outcomes and reducing costs. Princess Dina Mired of Jordan, president elect of the UICC, highlighted that noncommunicable diseases, including cancer, account for 70 percent of deaths globally and 80 percent of those deaths are in the developing world. “It’s time to unite,” she said, explaining how pharmaceutical companies are going to see huge impact in the number of lives they will save as a result of uniting their efforts. CEO of Seed Global Health Vanessa Kerry stressed the importance of investing in education and training for health workers to build a pipeline of future providers. She noted that health professionals cannot only train their successors, but they can support an entire health system. In Rwanda, a network of over 45,000 community health workers across the country are volunteering following a short period of health care training, and are incentivized through performance-based financing. There are several additional lessons to be learned from Rwanda in terms of bolstering primary health care, including learning from the country’s strategy around community sensitization and its community-based health insurance scheme. The government developed a scale of the population based on their income, and then worked to subsidize the contributions for those considered the poorest and vulnerable, while others considered able paid a contribution toward their health care. While the tangible efforts of building stronger health systems across countries that provide the basic care people need and innovating around finance to make that happen are critical, none of this can be achieved without cross-sectoral collaboration. A concerted effort for businesses, NGOs, local authorities, and civil society to join forces to improve health systems is the only way we’ll be able to reach good health and wellbeing for all by 2030. While individual efforts are a step in the right direction, only by synchronizing efforts and pooling resources can progress be made. Kenya is one strong example where this is working. The country is leapfrogging its way to UHC, according to Siddharth Chatterjee, U.N. resident coordinator in Kenya, who claimed it was down to the “3 Ps:” Political will, the right public policies, and cross-sectoral partnerships. But of course it isn’t as simple as copying one country’s methods and applying them to another. Contexts differ and it’s important to consider the local environment if health care for all is to be achieved. Take the context of a humanitarian crisis or disaster zone, for example, where there is so often a lack of access to health care. During the U.N. General Assembly event, the vast difference in the provision of health care in fragile or conflict-affected states and peaceful states was highlighted, with a widening gap between those that have access to health, and those that do not. One solution discussed was that of separate tracks in UHC — one for peaceful and secure countries, funded largely through domestic resource mobilization, and one that is donor-led for fragile and conflict-affected states. Elhadj As Sy, secretary general of the International Federation of Red Cross and Red Crescent Societies, noted that prevention of disease outbreak in a crisis context is essential. This requires a joined-up approach, including enabling the community to be better mobilized for prevention, ensuring that infrastructure is in place where needed, and harnessing the private sector’s skills in procurement. But Haoliang Xu, assistant administrator and director at the Regional Bureau for Asia and the Pacific of the U.N. Development Programme, warned that one of the biggest challenges is aligning the financial goals of all stakeholders — including the public sector, private sector and nonprofits. There was consensus that donor funding alone will no longer be sufficient to finance ambitious health outcomes. Devex investigated how to innovate on health sector financing and found that leveraging innovative public-private partnerships as well as creating tools that align incentives and reduce risks are clear next steps. Social impact bonds, for example, are a blended finance tool with potential to finance complex social issues such as health care by aligning the incentives of all key stakeholders. Focusing on PPPs in primary care Philips’ Omar Campos, senior director of funding partners, and Jan-Willem Scheijgrond, global head of government affairs, emphasized that while private companies are willing to invest in innovations toward the SDGs, they need to be shown that reasonable returns can be achieved. This is essential, as health system strengthening requires a strong base in primary care as well as solid referral chains to higher levels of care for the patients that need it. “We believe that a new, hybrid business model bringing together donors and impact investors, governments and the private sector has the potential to deliver on the SDGs,” they said in an op-ed. This, they agreed, could be done through combining government funding with private income flows to facilitate new, sustainable business models that drive better health care for all. This is something one government hospital in the northern Indian state of Haryana is putting into practice. Devex looked at how this PPP has overcome challenges to bring diagnostic services to those who previously couldn't afford it, or lacked access. How can the private sector help accelerate progress towards UHC? Forty years ago, the Alma-Ata Declaration of 1978 emerged as a major milestone of the twentieth century in the field of public health, and it identified primary health care as the key to the attainment of the goal of health for all, or what the World Health Organization is calling universal health coverage. Today’s developments in technology are allowing us to fulfil the Alma-Ata’s vision on bringing health care to all by using technologies to fill in the gaps of resources and transform. Technology can disrupt the financial and resource constraints we have been having in the last 40 years. However, technology alone is not the solution. As a leading health technology company, Philips plays a pivotal role in the transformation of the health care industry. And it does so with a clear vision — to make the world healthier and more sustainable through meaningful innovation — and a clear goal — to improve the lives of 3 billion people per year by 2025. Philips plays a pivotal role in the transformation of the health care industry. As a promoter of the Kenya Sustainable Development Goals Partnership Platform and World Economic Forum Primary Healthcare Coalition, Philips is investing in technology and business and financing model innovation in support of large scale strengthening of primary care systems toward UHC. One example is an approach called Managed Equipment Services, in which Philips took full responsibility for the renovation of the intensive care units of 11 hospitals across the country. The project is part of a seven-year contract between Philips and the Kenyan Ministry of Health to revitalize the country’s health care network. We need country wide replications of such partnership platforms across the world, including in disaster struck areas. Philips would like to continue playing a strategic role in innovating solutions and business models for primary care, leveraging the role of technology to provide access to quality care including referral to higher levels of care for those who need it. All of that was previously unthinkable. This way, primary care can truly become the strong pillar of UHC the way it was envisioned 40 years ago. Innovation and technology can play a key role in driving more inclusive health care for all. There is no single answer, but rather the need for a sustainable, forward thinking, joined-up approach. As well as investing in primary care with proper referral chains, stronger and more integrated partnerships between governments and the private sector are essential. And as a shift in aid financing continues to evolve, the global development and health communities will have to look toward more innovative finance and business models that include support from the private sector. Over the past year, through two online content series and a high-level event, we’ve found that achieving UHC, implementing improved primary health care, and leveraging innovative finances and business models require some big thinking. These ambitious targets can, however, only be achieved by taking small actionable steps. From creating partnerships to working with local health care workers, numerous communities are already seeing success in the development of their health care availability. We can take the lessons they’ve learned, consider the challenges they’ve faced, and move forward united to accelerate progress toward the health and health-related SDGs.